With new duty rates on wine in the UK from 1 February 2019, I’ve updated my statistics and thrilling graphics, and added some new tables for a fairly comprehensive guide to UK wine duty. A rant it may be but, if nothing else, it should help you make better-informed decisions when buying wine in the UK – and on the continent. 1. 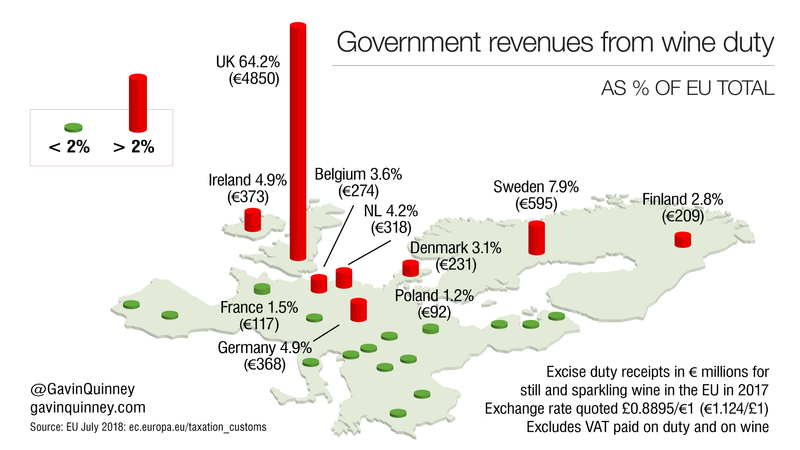 Wine was singled out for a duty increase in the autumn budget, effective 1 February 2019, while excise duties on spirits and beer were frozen. Ran the headline on lbc.co.uk. 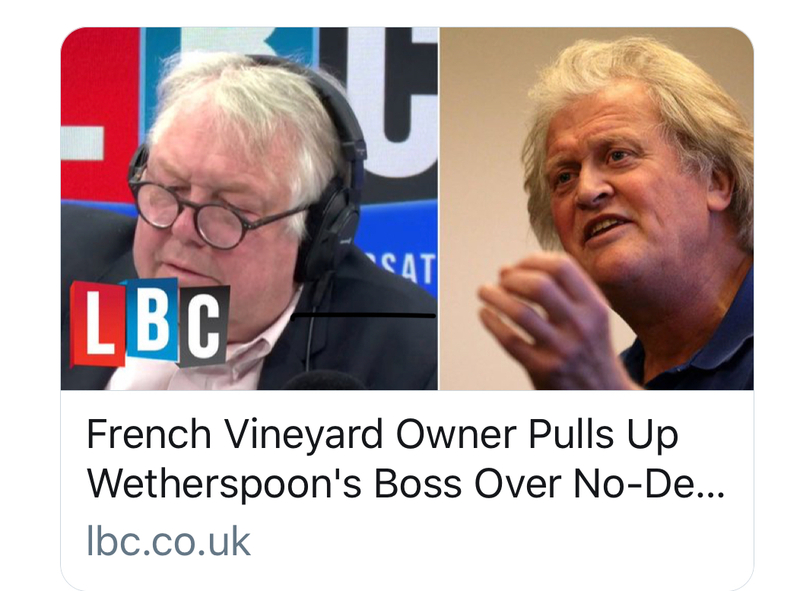 A French vineyard owner pulled up the chairman of JD Wetherspoon when he said wine would be cheaper after Brexit. Tim Martin, who founded the popular pub chain, is a leading Brexiteer and insisted the UK has nothing to fear from a no-deal Brexit. He told Nick Ferrari no-deal is better than Theresa May’s deal and talked of scrapping tariffs on New World wines. He said: “If we leave the EU, one of the advantages is that we can scrap tariffs. So Gavin’s wine will continue to come into the country tariff-free, but the difference will be you’ll save 8-12p per bottle on wine from the rest of the world. However, Gavin Quinney, who runs a 63-acre vineyard near Bordeaux, pointed out: “Tim, you’re not selling children’s clothes and bananas in Wetherspoons, you’re selling wine. “The most you’re going to reduce a bottle of Australian wine is 8p and if the EU finishes the negotiation with Australia and removes that tariff, 8p we’re talking about on a bottle of wine, compared with the UK duty from 1st February will be £2.23 – 28-times more. November has been a hectic month, though less so in the vineyard itself. 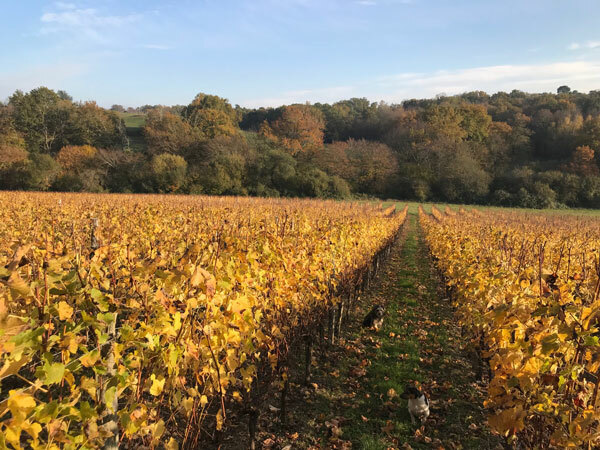 We sometimes forget how beautiful it can be at this time of year, with the golden rows of vines set against the autumn backdrop of the woods. 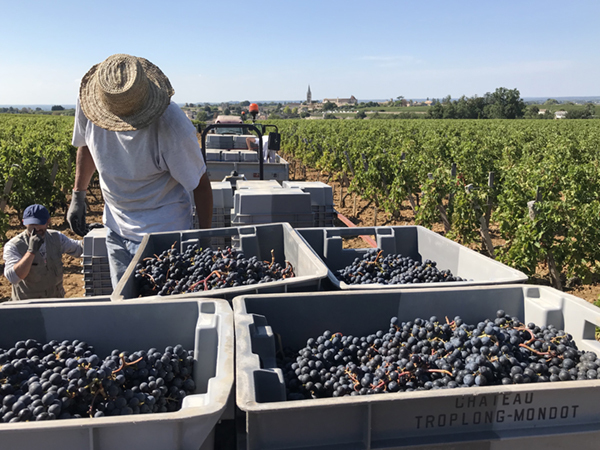 This month’s exciting review covers the Bordeaux 2018 vintage and how the weather impacted on the harvest. 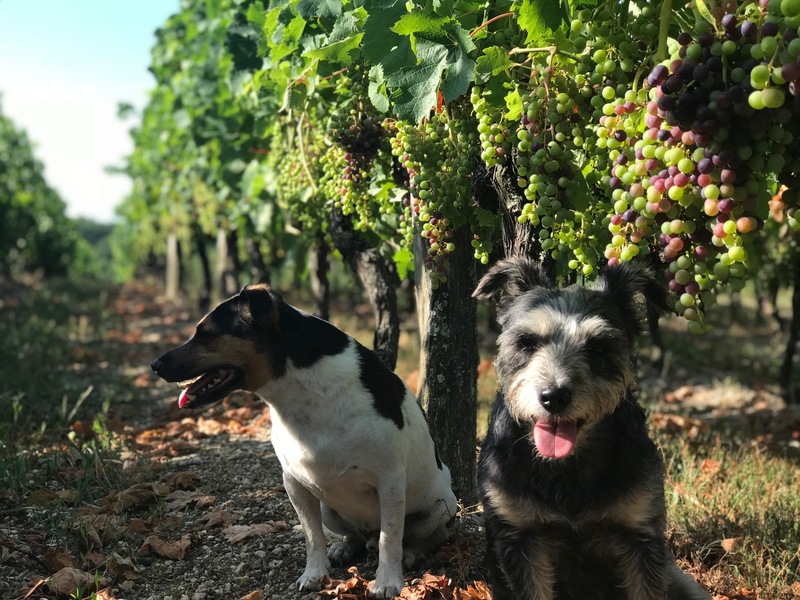 Below is a cutdown version of a longer article that Gavin has just put together for Jancis Robinson’s website and for Liv-ex (the London International Vintners’ Exchange). This report was also published on JancisRobinson.com and on Liv-ex. Bordeaux 2018 will be remembered as an exceptional year, with no shortage of outstanding wines from this extraordinary vintage. 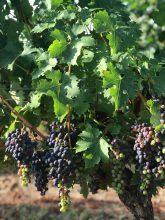 The weather too has been exceptional, with a glorious summer extending long into the September and early October harvest, but the vintage had begun with a bizarrely challenging first half of the growing season. It has ended up, not for the first time, as a year of mixed fortunes. I’ll try to explain the impact of the weather on yields and quality using – as ever in these vintage reports – a few graphs and statistics. A wet winter, followed by a seriously soggy spring. The threat of mildew, from spring onwards, was the strongest for decades. Hailstorms in May and July caused damage in some unlucky areas. The flowering in May and June was largely successful. A glorious summer, preceded by just enough rain in late June and early July. To have three complete months of sunny, dry weather from early July through to early October is rare. Optimal harvest conditions, stress free, with no risk of rot. A vintage of great potential, with outstanding reds and some very good whites. Balance will be key as alcohol levels are generally quite high. The fourth very good to excellent vintage in a row for 75% of the leading châteaux. Plentiful yields for most growers but low for those hit by mildew or hail. Overall Bordeaux volumes, at a guess, are close to the 10-year average. 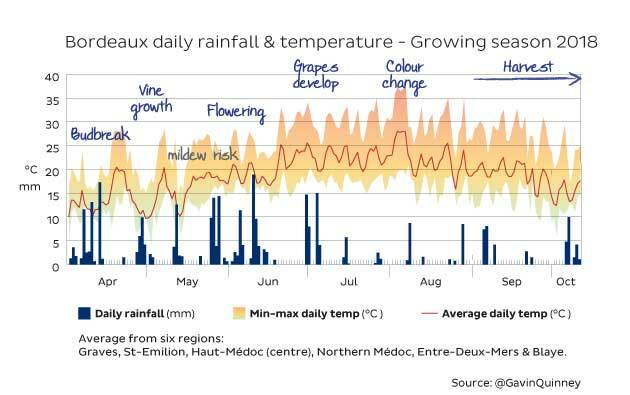 Here then is the story of the vintage, using daily statistics that I’ve compiled from six different weather stations around Bordeaux. The amount of rain can differ considerably from one area to another, and even from one commune to another, but this gives a pretty good impression of how the growing season panned out. 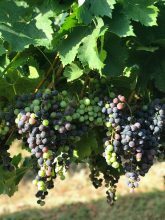 For a comparison of 2018 with the last two vintages – and they are quite different – see the appendix below. 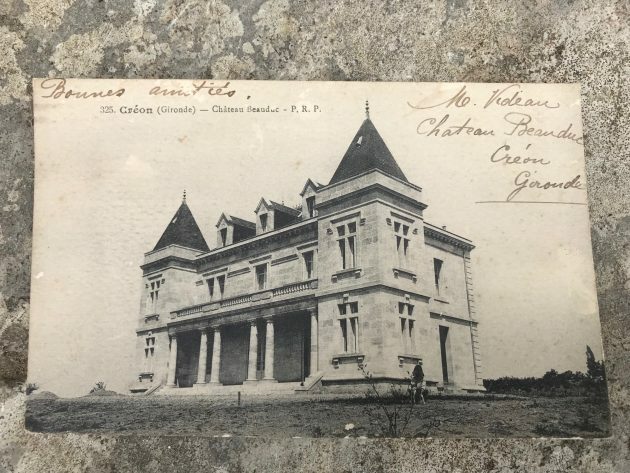 At the end of July – the month in which France won the football World Cup – I wrote that Bordeaux 2018 was ‘a game of two halves’. I have to admit I was taking a punt on the weather staying fine for August and September and even, as it happened, for early October, yet it’s extraordinary how the weather stayed so sunny and dry after such a wet start. 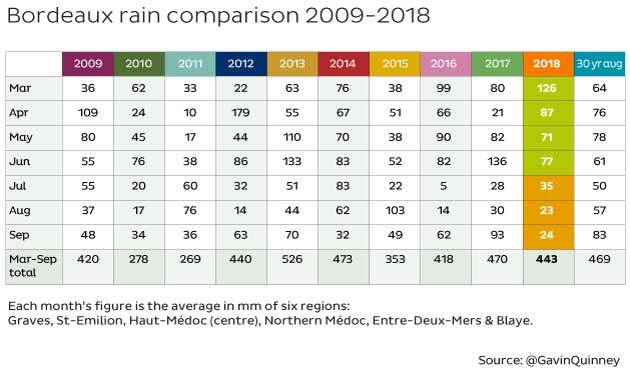 The stark contrast in the amount of rain for the period from March to June, compared to July, August and September, and how this compares to other vintages, can also be seen in this grid showing rainfall each month over the last ten vintages. 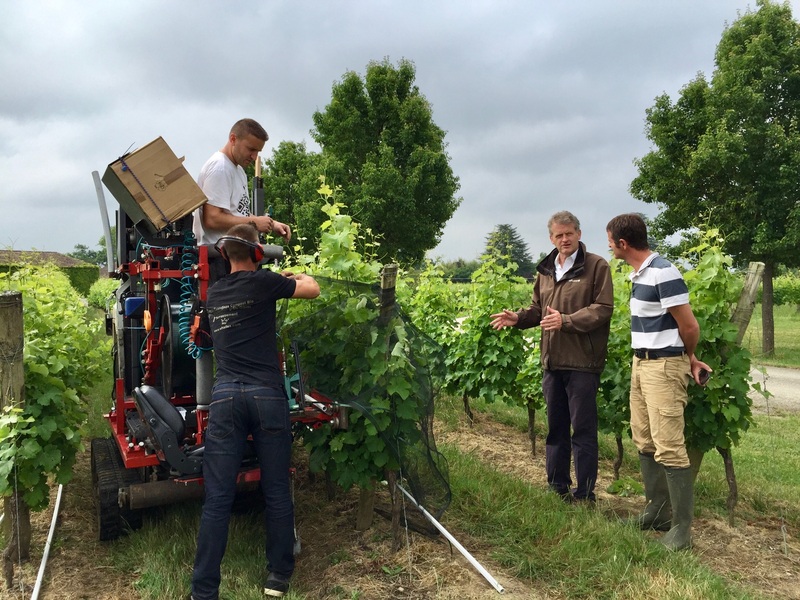 This month has seen our twentieth harvest at Bauduc. We took over the grapes that were on the vines when we arrived at the start of September 1999, so we haven’t quite clocked up 20 years, but the 2018 vintage is still a (frightening) milestone. Daniel was already here, and he still has no grey hairs, while Nelly joined us as a trainee. Pictured below, they’ve both put up with us ever since. 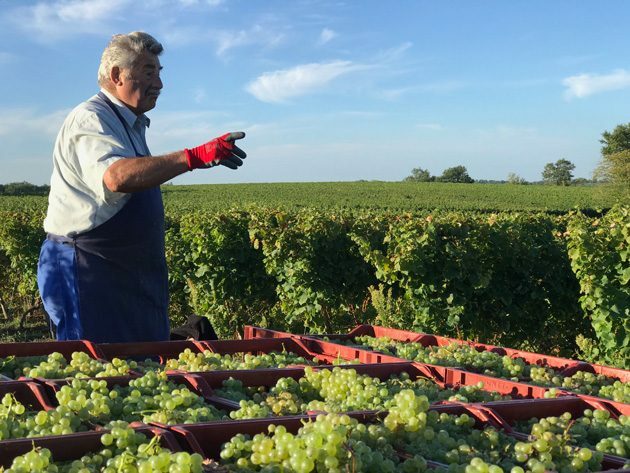 Meanwhile, Michel, above, and better known as known as Papi, had already retired back then yet he’s volunteered to help in each and every harvest, and at 85 is still going strong. There’s hope for us all yet. 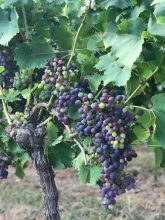 Every stage of the grapes’ development is fascinating to some of us but August is the month when most of the bunches change colour (véraison) in Bordeaux, so you really get a visual perspective on how the different varieties perform. 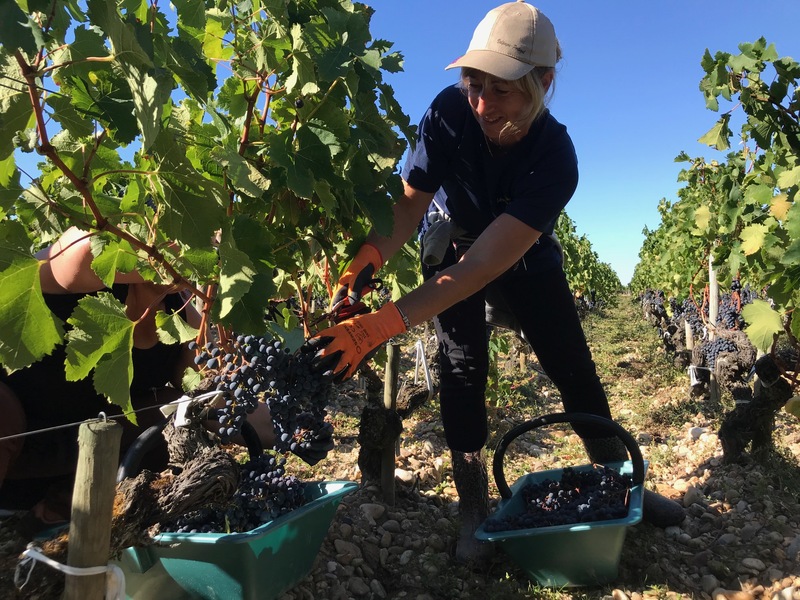 Another dry and unusually hot month, and the white harvest has already kicked off in the more precocious Bordeaux vineyards, namely to the south of the city in Pessac-Léognan. Most white vines, like ours, are sensibly holding back just long enough until the managers, oenologists and staff return from their holidays. 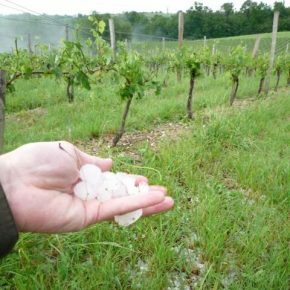 The INAO, the body that controls viticulture and wine production in the protected Appellations of France, have given approval for the use of anti-hail nets following some extensive tests in Burgundy. 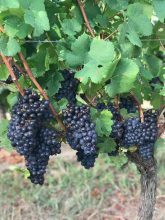 Until now, growers in Appellation Contrôlée vineyards have not been allowed to install nets against hail because the effect on the grapes and on the vines hasn’t been properly understood and they can alter the nature of the terroir. Or something like that. 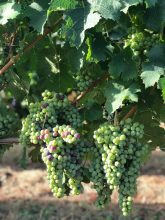 In the big picture of things, this may not seem to be especially significant news but it’s an interesting development for us and for any wine growers who have to live through the fairly regular stress of hail storm alerts. And, from time to time, the real losses from hail damage. This post also appears on JancisRobinson.com and on Liv-ex, the fine wine market website. I’ll keep the football analogies to a minimum but the end of the month in which France won the World Cup seems an appropriate moment to reflect on the pluses and minuses of the season so far. 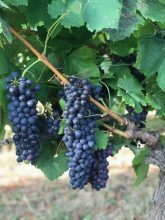 For wine growers, or viticulteurs, the business end of the season will soon be upon us.